The fact sheet summarizes the advantages of delaying your Social Security benefits beyond age 62, when feasible, as well as the critical role that Social Security plays in many retirees’ financial wellbeing. 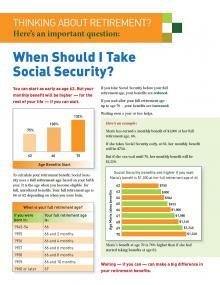 It is based on the brief, When Should I Take Social Security Benefits? Questions to Consider and the video Social Security: It Pays to Wait.